Felicia Castro, the protagonist of the new Image Comics series I LOVE TROUBLE by Kel Symons and Mark Robinson, debuting in December, doesn’t have much going for her. A New Orleans grifter on the run from a mobster, Felicia has to flee the Big Easy to hide out in the Midwest. Then her plane crashes. Instead of it being the end for the Felicia, the crash turns out to be a new beginning. Felicia discovers she has the ability to teleport, a power she thinks will be an easy fix to all of her problems. But Felicia is someone who follows trouble, and her power opens up a whole new world of crime and exploitation. Symons was a producer of The Dungeon Masters, a documentary about Dungeons and Dragons players, and also produced and directed the documentary Excavating the 2000-Year-Old Man. He was involved, as a development executive, in the film adaptation of Tom Clancy’s Jack Ryan novel The Sum of All Fears. He also developed the feature films Sahara and Invictus. I LOVE TROUBLE is his first comic book series. Robinson has been drawing comics professionally since 2001 and is best known for his work on the IDW series Storm Shadow and the Marvel series Hulk and Skrull Kill Krew. 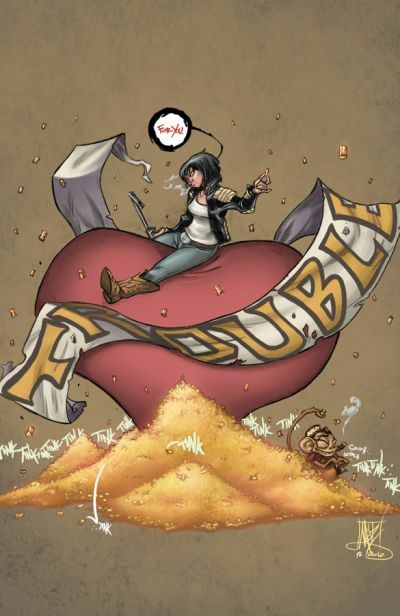 I LOVE TROUBLE is a full-color, ongoing comic book series. Its first issue will be in stores on December 5 and is available for pre-order in the December issue of Previews.